Writer and long-time transit rider D.J. Waldie ruminates on a possible policy change at Metro that would shift bus service hours from low-ridership lines to busier routes in order to offer more frequent service in those corridors. D.J. is concerned, however, that this amounts to offering better service to discretionary riders on higher-income corridors while leaving the truly transit dependent — the folks he meets on buses late at night — behind. Jarrett Walker at Human Transit also wrote about this recently — and offers a different perspective. I’ve met with Metro staff and will also be writing about this soon. One point of emphasis: this is certainly important and is something that is underway but requires approval of the Metro Board of Directors. I do want to emphasize that the intent is not to reduce overall bus service hours but rather to redistribute some of them — and to make some other improvements to help boost bus ridership and make it more financially viable. So much for the days of short headlines when the number of adjectives were somewhat limited! The article looks at the proposed project to provide better lighting, signage, access to buses and more at the Rosa Parks Station, which serves as a transfer point between the Blue and Green Lines and is the fourth busiest Metro Rail station behind Union Station, 7th/Metro and North Hollywood. One note: Metrolink, which is funded in part by Metro and runs commuter rail in our region, has already started to install the anti-collision technology, putting it well ahead of many other railroads. When it comes to climate change, I consider anything written by Elizabeth Kolbert to be a must read. In this article, she looks at one of the thornier points of climate change: no one really knows exactly how much the average global temperatures need to rise to provoke all types of havoc from rising sea levels. A new study suggests that two degrees Celsius is the trigger, which is lower than political agreements. As we’ve mentioned before, switching from driving — especially driving alone in a vehicle with average fuel efficiency — to taking transit, biking or walking is a good way to lower your carbon footprint. Hey, I’m on Twitter and Instagram! They made a mistake on the 110/101 interchange image (the four level). They called it the 10/101 interchange. Thanks! After using such interchanges a couple of times I think I like them. It’s just a little confusing first times through! Metro could take note though. I think interchanges are a good template on configuring train/subway lines. Almost like the regional connector, but a bit more complex. Maybe expensive, but rather efficient and possibly longer lasting than the interchanges themselves. Why transfer, when your train could just make a left hook? In example Wilshire/Normandie left hook before Vermont/Wilshire and just connect with Vermont and beverly, and so forth. It would create a more fluid system if the tracks could handle the frequency. Im pushing it, but Id even extend a segment of the line further up Vermont to the foot of Griffith/LosFeliz (if allowed) and boom, a new line is born between potentially Wilshire Western and Griffith/LosFeliz. I I probably would see this in my lifetime, but hey; these things just cross my mind. 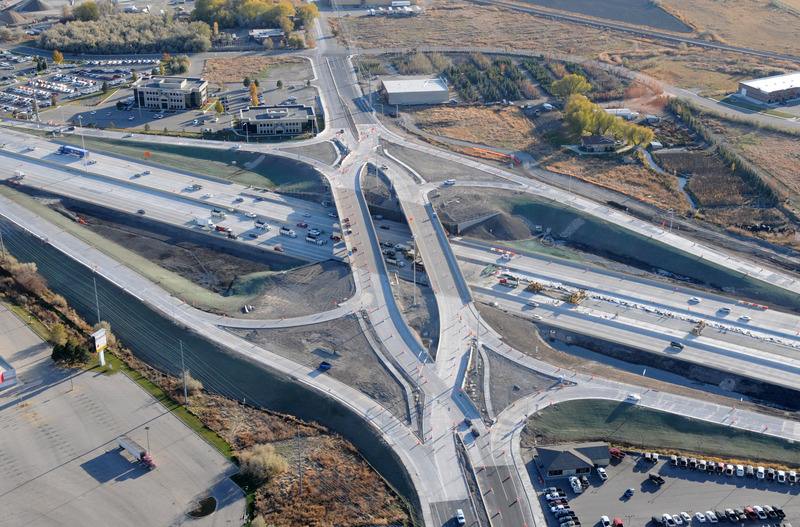 Diverging diamond interchange. Interesting concept, although I don’t see it doing anything better than the time-honored (albeit real estate intensive) full-cloverleaf pattern. It reminds me of at least one or two Silver Line stations, the ones with a single central platform. Love the photo series on interchanges – brought back real memories. When I lived in Ontario the 400 / Alan Expressway (with a TTC – Toronto Transit Commission subway track running through the middle – look hard!) was the major bottleneck – big decision was whether to take the 401 west – up in the picture – on the express lanes (5 lanes in the middle) or the collectors (3 lanes on the side). Usually express was faster, but not always. I also worked on the concept lighting design of the 404 / 407 – at the time, computer modelling wasn’t what it is now and we couldn’t decide whether the bottom decks needed tunnel lighting or not. Good times! I also wonder if the I 10 / 101 interchange has killed more people that the gallows. To another poster’s point: Cloverleafs have fallen out of favor because of the speed differentials at the conflict points – people coming off a tight curve are trying to merge with high speed traffic. I don’t live in LA, just a frequent visitor and transit geek, which is how I know the Trimet (Portland Or) is also called “How we roll”. They had the name first, but this blog is way better.